The Belkin Car Navigation + Charge Mount is a safe and simple way to keep your iPhone or iPod touch in place and comfortably in view. And with its built-in Lightning connector, you'll never go without a well-charged smartphone. The Belkin Car Navigation + Charge Mount frees you up to use your phone without taking your eyes off the road or hands off the wheel. The flexible neck adjusts to the viewing angle that suits you best, making it easier than ever to perform your normal phone operations without risking safety or peace of mind. 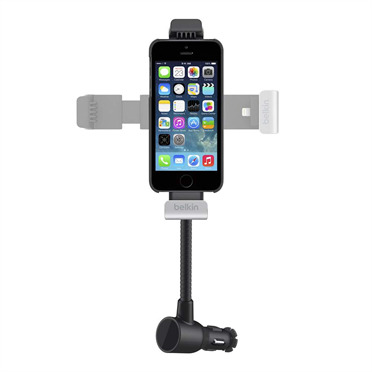 The Belkin Car Navigation + Charge Mount is designed with brackets that adjust to your device and then lock in place for a secure hold. Just dock your iPhone 5/5s or iPod touch into the built-in Lightning connector to start charging and navigating. A joint behind the brackets on the Belkin Car Navigation + Charge Mount let you rotate your device for viewing in either portrait or landscape mode. Portrait mode is ideal for charging, listening to music and hands-free phone calls, while landscape view makes using your favorite navigation apps fast and convenient. In addition to placing your device in a safe line of sight, the Belkin Car Navigation + Charge Mount also charges your phone while you're driving, so wherever your day takes you, you'll arrive at your destination with a device that's ready to go. Just plug the base into your car's CLA power outlet and dock your iPhone or iPod touch into the built-in Lightning connector to being charging. Over time, certain car mounts can lose traction while sitting in the CLA power outlet, resulting in the whole thing slipping when you dock your device. 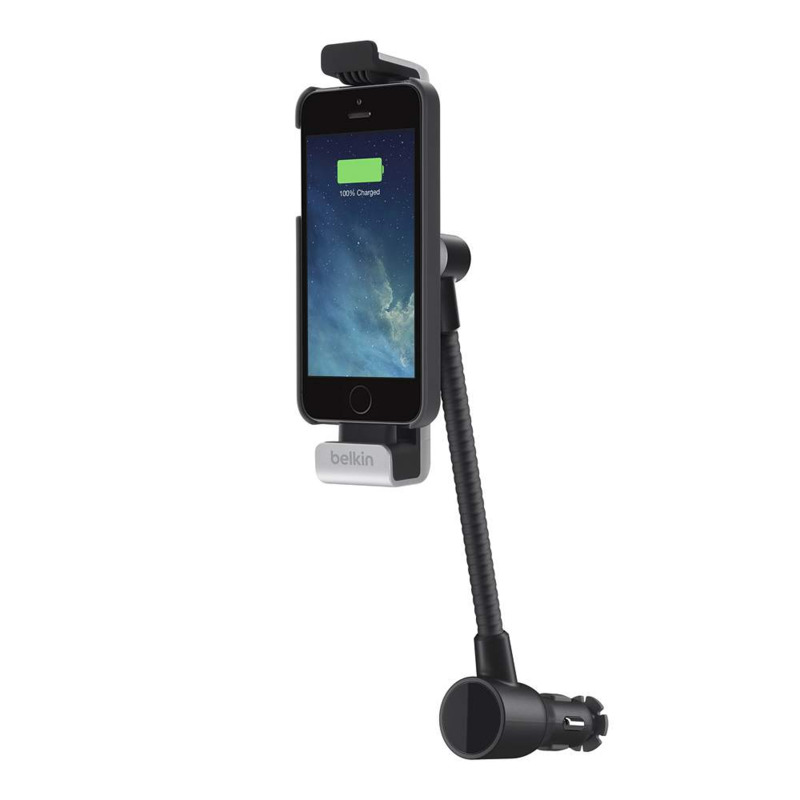 The Belkin Car Navigation + Charge Mount was designed with non-slip pads to prevent loosening & slippage, so your mount will always stay fully upright and securely in position. Note: Because of the secure non-slip fit, we recommend fully removing the mount from the CLA adapter before repositioning it. Turning the base while still inserted may cause damage to the outlet. Depending on the type of case you have, you may need to remove your case before docking. If your speakers, connector port and AUX port are fully exposed when your case is on, you should be able to easily charge and sync your device without removing the case.